‏@BeccaRum This racism has to stop y'all. ‏@BeccaRum I am getting really sick and tired of being classified as a white person and therefore uneducated, racist, and excluded by black twitter. 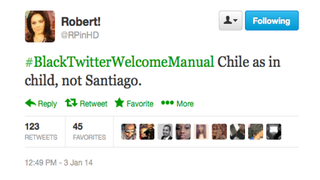 Following the tradition of responding to ignorance with constructive Internet snark, @RPinHD started the hashtag #BlackTwitterWelcomeManual, a handy guide for those who are inquiring about "membership."